Welcome to Forever Nigella. I'm thrilled to be hosting this month...and the theme is Christmas! Nigella even has a whole book devoted to the subject. The home of Forever Nigella is at Maison Cupcake﻿. Creator Sarah describes Forever Nigella as 'the only regular blogging event to share your culinary moments dabbling with the domestic goddess'. So be your creation sweet or savoury we'd love it if you could join us for this month's challenge. This may be Laura Loves Cakes but you are most welcome to enter absolutely any Christmassy Nigella recipe...even your Christmas lunch if the recipe came from the domestic goddess herself! Why not dig out all of your Nigella cookbooks and magazine recipes or check out some online sources and join in with this month's challenge. Forever Nigella #21 is being hosted by Laura of Laura Loves Cakes. This month’s challenge is to prepare and blog any Nigella Lawson recipe which is suitable for Christmas. 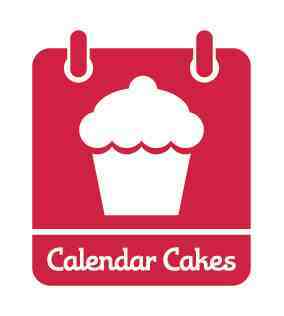 Forever Nigella is organised by Sarah at Maison Cupcake. Use the linky tool or email me at lauralovescakes@yahoo.co.uk cc’ed to sarah AT maisoncupcake DOT com. I probably don't need an entirely new blog entry for this, but it's my blog, my baking, and I'm going to do it. It's my little corner of the universe that I get to control all by myself, so here I go. 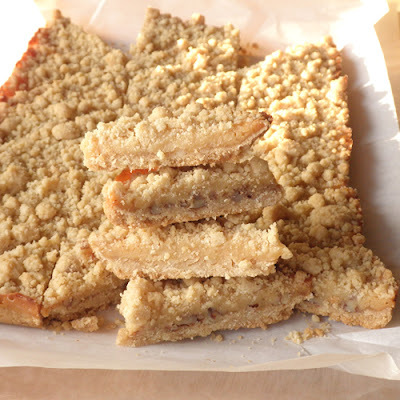 The Caramel Crumble Bars I made the other day went over so well (even my husband ate a bunch of them), that I decided to try them with nuts and a splash of vanilla. I actually made this pan with macadamia nuts AND pecans--not mixed, just one side for each type of nut. Are they good? Yes. Tasty. I took two of them to work, one macadamia nut and one pecan, and evaluated with each bite whether I really liked them or not. I do like these better with the addition of nuts, but I don't know if I'll crave these. They're easy to make and look and taste good, so I probably will make them again for other people, but if I'm baking something yummy just for me, it's going to be Frosted Brownies, Gooey Brownies w/ Dove Chocolate, or no-bake Chocolate Truffles. In a medium mixing bowl, combine the flour, brown sugar, baking powder and salt. Pour the butter over the top, then mix it through until it’s evenly combined. Mixture will be crumbly with some crumbs larger than others. Reserve 1/3 of the crumble for the topping, and press the remaining 2/3 into the lined pan. Before firmly pressing in, sprinkle nuts evenly over the top. Press in firmly all over and make it flat. Bake at 350 degrees for 10-13 minutes, or until it starts to brown on the edges. While the base is baking, make the caramel filling. In a small saucepan over medium-low heat, combine the condensed milk, butter and corn syrup, stirring continuously. Bring it to a gentle boil and keep it there, stirring continuously for 4-5 minutes until caramelized slightly and thick. Remove from heat and stir in vanilla extract. Remove the base from the oven, and pour the caramel filling over the base. Smooth the caramel to create an even surface, and sprinkle the remaining 1/3 of the dry mixture evenly over the top. Return the whole thing to the oven for another 10-13 minutes, or until the crumble topping is cooked through and slightly browned. Allow to cool, then cut into triangles. Food stylist I am not, but trust me, these dumplings were so tasty, we had to go back for more. Good food courtesy of a great Chinese restaurant from Castlemaine. No Dagwood Dogs for us. The CWA ladies made the most delicious cakes for afternoon tea and there was good coffee to be had. This is no ordinary show. No visit to the show is complete without a trip to the Pavillion. So much talent. We nearly missed the poultry, I just adore looking at all the breeds, we even took home some beautiful blue free range eggs. The kids thought this area was very funny, men dressed in suits and ladies in fancy clothes running around with their dogs. We became quite enchanted by a pair of Norwegian Elkhounds, and their very kind owner let the kids give them a walk. All the kids had a pony ride, I wonder if the Big Bowerbird will be too big next year. When you thought their could be no more, up puffs a little steam train. This man was so wonderfully patient with the Middle Bowerbird's slightly wild hammering, he and the Big Bowerbird made nest boxes to take home. Awesome job Kyneton Show organisers, my favourite Country show ever. When we go out for Chinese food, Katherine always orders dumplings. She will eat any kind, but the pork-filled potstickers are her very favorites. Any time she is asked to list her favorite foods, dumplings are in the top 5. She dearly loves those little half-moon treats. Kate's class is having a food tasting party tomorrow. Each child is supposed to bring a favorite dish and everyone will try a bite. Ethnic recipes are encouraged. Katherine handed me the note about the tasting party on Monday. I asked her what she wanted to bring. She shrugged. I asked if she wanted to take Chinese food and she nodded. What kind? Another shrug. She just looked at me and I could see the wordless plea in her eyes. I knew what she wanted. "How about dumplings?" I asked. Her answer was immediate - "YES!!!" accompanied by whoops of delight and much jumping up and down. I found a recipe for pork dumplings and we went shopping for the ingredients last night. We could only find square wonton wrappers, not the round dumplings wrappers. But that really didn't seem to be a problem. In fact, it would solve the problem of trying to somehow crinkle the edges of the dumplings into the perfect little pleats they have in restaurants. We were ready. Tonight, we cooked. Now Katherine and I have both made dumplings before, with Chinese friends and at China Camp. But we have never attempted dumplings on our own. So we knew we were in for an adventure. We mixed ground pork with minced onion, ginger, brown sugar, rice vinegar, and sesame oil. It smelled like China... Then we put little scoops of the filling in the middle of the wrappers. Katherine remembered how to seal them - dip your finger in water, rub it around the edge of the wrapper, and fold it in half to make a triangle. We experimented with folding the corners to make the dumplings look fancier and ended up making them look like fat little diapers! Katherine was in her element, talking and singing and enjoying every moment of the dumpling making. Our filling and our wrappers ran out at about the same time. Perfect! Then it was time to cook them. And that was where the dumpling adventure turned toward disaster. The instructions called for boiling the dumplings for a couple of minutes and then taking the pot off the heat and letting them sit in the hot water for a while. This was pretty much what we'd done when we'd helped make dumplings in the past. But apparently, we have not yet learned the fine art of knowing how long is long enough to stew in hot water. Because our dumplings stewed for too long. The pork cooked up beautifully. But the wrappers disentigrated into slippery shreds of noodle-like mess. The cute little diapers were unrecognizeable. We had a pot of sausage soup. I felt terrible. Katherine had so wanted to share this favorite food, this little bit of her heritage. And it was ruined. But Katherine was undaunted. There was sausage in that pot. She grabbed a spoon and took a bite and grinned. Our stew looked awful, but it tasted just like dumplings. Delicious! Katherine is taking a big bowl of deconstructed dumplings for the Tasting Party tomorrow. And she is perfectly happy with that. After all, they taste terrific. I wrote a note for her teacher to read to the class. I explained how much Katherine loves dumplings and how this was our first try at making them on our own. I described the cooking disaster. I wrote "Sometimes when you cook, things don't turn out like you wanted. That's okay. Our dumplings will be better next time. For now, take a bite of meat (it tastes like sausage) and a little bit of wrapper (it tastes like noodles) and just imagine a beautiful Chinese dumpling." I can't wait to hear what the 3rd grade thinks of the world's ugliest dumplings. I'll bet no one likes them as much as Katherine does. But then, Kate understands that the best food is made with love. I'm looking forward to the next time we try to make dumplings. Look at that beautiful interior. Soft and bready. 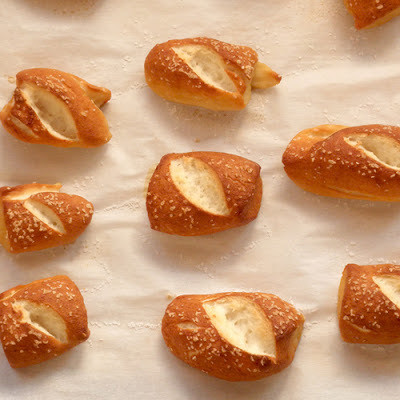 Now that I know my gluten-limited son likes this soft pretzel recipe, I decided to bake some up that I can freeze for a quick breakfast for him (and his brother who is not gluten limited). My highly allergic nephew is no longer here, so I added the dairy and egg back into the recipe. 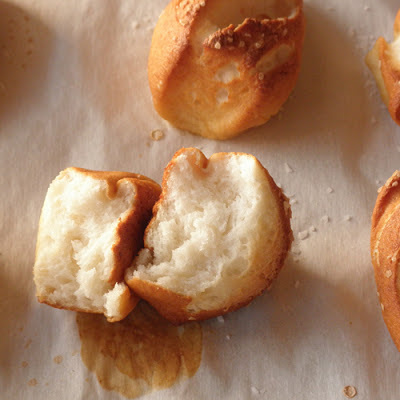 If you want the egg and dairy free recipe, see my Gluten, Dairy, and Egg Free Soft Pretzel Nuggets post, which was also adapted from Gluten Free On a Shoestring. I like the way these turned out better than the previous try. 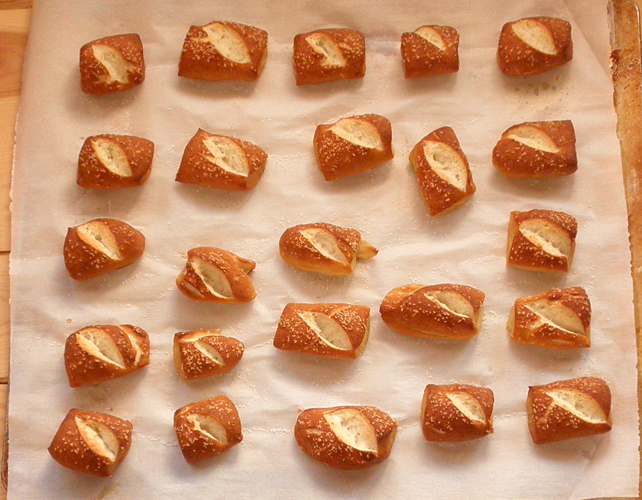 I think it's because I used more baking soda in the baking soda bath, and the pretzels turned out much darker. I also made these bigger because I really didn't want to take the time to make the tiny nuggets. So I have chunks here. I was so impressed with the texture of these pretzel chunks. I mean, when you break one open, it looks just like a soft pretzel made with wheat. Although my kids don't notice a difference in flavor, I do notice a slightly different flavor with these, so I can tell that they're not made with wheat. They're still tasty and satisfying, and as long as Max is happy about them, I will keep spending the money on Better Batter All Purpose Gluten Free Flour. It's totally worth it. Line two or three cookie sheets with parchment paper and set aside. In the bowl of a standing mixer fitted with the dough hook attachment, whisk together the flour, yeast, powdered milk, cream of tartar, baking soda, sugar, and kosher salt with a regular hand whisk. Add the cider vinegar, butter, and egg whites. Mix on low speed until mixed. With the mixer on low, slowly pour in the water. Once all the water has been added, turn the mixer up to high and let it mix for about 3 minutes. With the mixer on low speed, add more flour, one tablespoon at a time, until the dough starts to pull away from the sides of the bowl in spots. The dough will still be pretty wet, but that's okay. Turn the dough out onto a lightly floured piece of parchment or wax paper. Dust the top lightly with flour and divide dough into four pieces, and form each into a rope that is about 1 inch in diameter. Cut each rope into 6 pieces and set on parchment lined cookie sheets to rise, covered with plastic wrap, for 40 minutes. Nuggets should be about 1 1/2 to 2 inches apart of the cookies sheet. Repeat with remaining dough. While dough chunks rise, bring the baking soda bath to a simmer in a deep pan or large pot over medium heat. Once nuggets have risen and soda bath is boiling, boil 4 nuggets at a time for just under a minute, turning a time or two to make sure all sides get boiled. Remove nuggets with a slotted spoon and touch back of spoon to a paper towel to drain a little. Place chunks back onto parchment lined cookie sheet. Sprinkle with coarse salt. When all chunks have been boiled and salted, cut a small slash into each nugget with a sharp serrated knife. Bake at 375 degrees F for about 20 minutes, or until well-browned. Remove from oven, allow to cool a few minutes and enjoy. my man has been busy making us a coat rack for our family room. 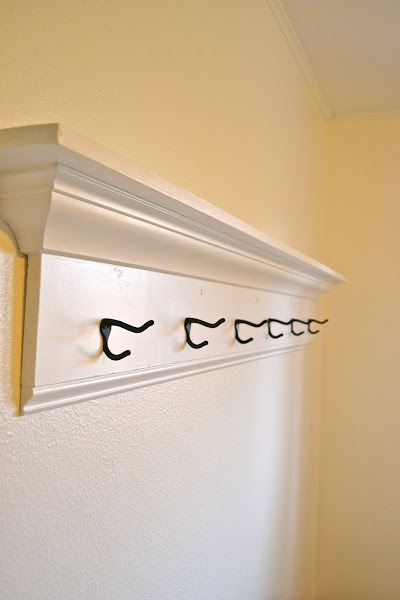 i wanted a place to hang some of our coats in our family room. i also wanted a place to display some of my favorite pictures and some artwork. 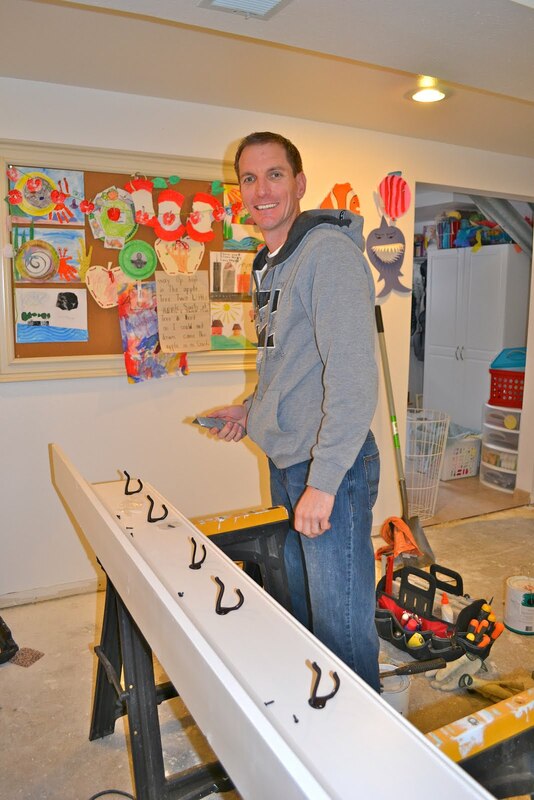 i'm very thankful that i have such a handy guy and one who doesn't mind helping me with home projects! Welcome to this November's Calendar Cakes round up. This month it was a bit more challenging with the theme being Bread, Buns and Rolls...but I have to say that our bakers excelled themselves wth all manner of beautiful breads, bountiful buns and ravishing rolls! Quick off the mark this month was my co-host Rachel from Dolly Bakes. 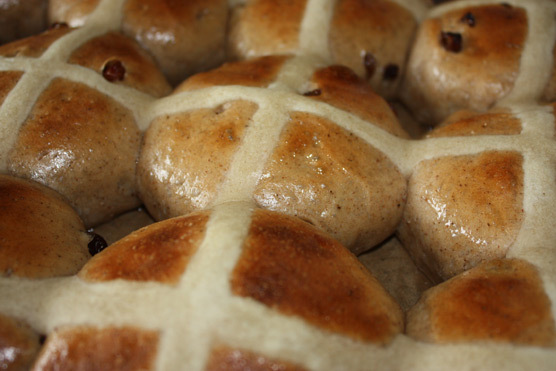 These were her first attempt at Hot Cross Buns...and I think you'll agree she did a grand job. 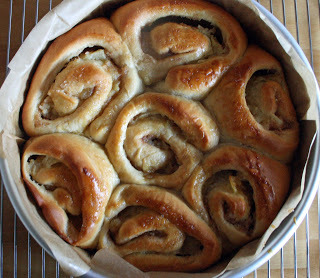 Next up my offering of Toffee Apple and Cinnamon Buns. I've had my eye on these for a while and I finally got round to making them...they were really tasty and there's a gorgeous caramel layer lurking underneath the buns you can see in the picture. 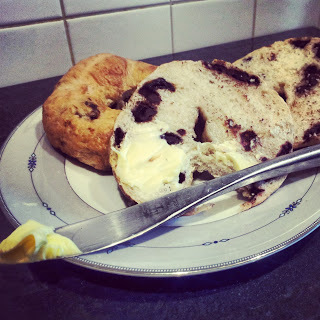 An adventurous bake next from How to Eat an Elephant who brings us Chocolate and Cherry Bagels which turned out perfectly. Bagels are definitely on my 'to-bake' list after watching the GBBO this year...and I hope they turn out as well as these...and what a gorgeous flavour combination. Our next entry is winging it's way all the way from Austria. The Charmed Cupcake produces some gorgeous bakes and this is no exception...it's a Danish Chocolate Streusel-Swirled Coffee Cake. Despite the name this is more of a bread as it contains yeast. A slice of this of a morning would certainly set you off on the right foot for the day! 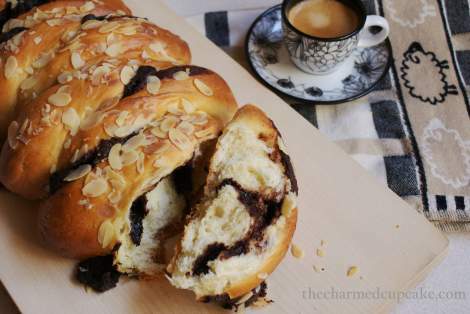 Laura from How to Cook Good Food brought us her Dark Chocolate Plaited Prune Loaf. Laura is a keen advocate of homemade bread and even attended a course to hone her skills. This loaf is particularly splendid as it's plaited which gives it that great appearance. 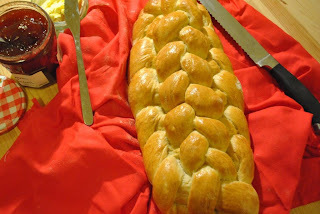 Another fabulous plaited loaf next...this one is from Lottie at Lottie's World of Cakes and Bakes. It's a Paul Hollywood recipe and there's eight strands in total. This loaf was inspired by the challenge from the recent GBBO episode...and I think Lottie's loaf certainly wouldn't look out of place on the series. Choclette from Chocolate Log Blog entered these wonderful chocolate cinnamon rolls. The recipe is from Green and Black's second chocolate recipe book...Ultimate. 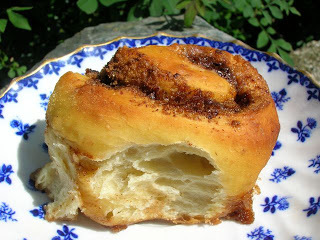 Chocolate is just the thing to jazz up a cinnamon roll and I can only imagine that these would taste heavenly straight out the oven! Having only made one bread product previously I went crazy this month and made two within a few weeks of each other. 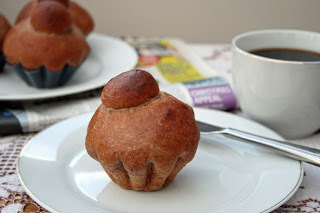 I wanted to make something chocolately as the We Should Cocoa challenge this month was also (chocolately) bread. So I decided to make these chocolate brioche rolls, inspired by a visit to a Parisian boulangerie! 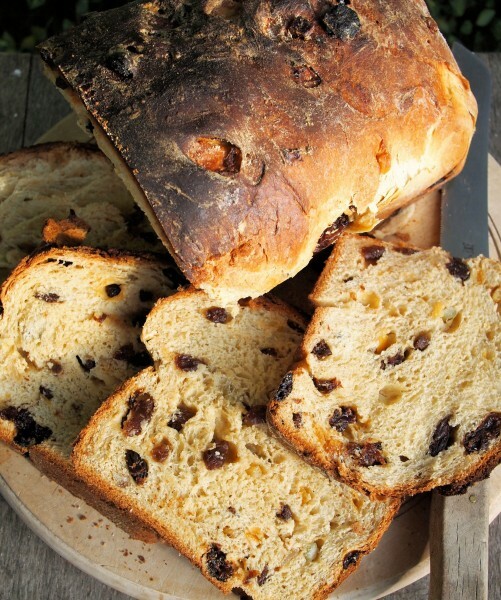 This luscious looking loaf is from Karen at Lavender and Lovage. This is Lincolnshire Plum Loaf with the recipe being randomly selected from England’s Heritage Food and Cooking Book, Karen then combined it with another recipe she had lurking on a scrap of paper...and the happy result was this festive loaf. Apparently Bara Brith is Welsh for speckled bread which I didn't know before reading about this Welsh speciality on Food Glorious Food. It certainly looks good and perfect with a cup of tea. 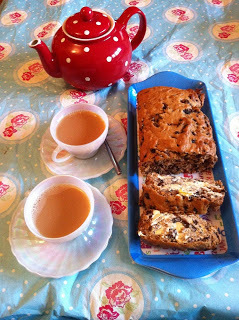 How about a Spiced Chocolate Breakfast Loaf from Jen at Blue Kitchen Bakes. Another tasty breakfast treat and this one would certainly give you a kick in the morning as it contains chilli powder! Jen also added some wholemeal flour and to achieve the swirl the dough is rolled before being popped in the tin. Caroline from Caroline Makes was very brave and attempted pain au chocolat in her breadmaker... and what a fab job...they turned out really well. 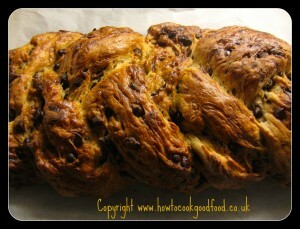 Ros at the More than Occasional Baker made this fab Apple Cinnamon Chocolate Braid. Ros has never made bread before but she conquered her fear to make this great bake. It's a lovely combination of apple, cinnamon and chocolate and you can see how she braided it on her blog. 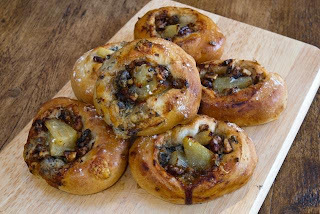 Next up we have another spicy entry from Liv a Little Bakery...Jalapeno Cheese Bread. As Liv says "This cheesy bread has a fiery kick and be warned it will leave you craving a second slice!". This is an unusual loaf but it's sure to be a winner. Helen from @HudsonBakery has just started a baking business and she made us these Pear, Gorgonzola & Walnut breads. They look fab...and I bet they'd be divine warm with that melted cheese...yum!